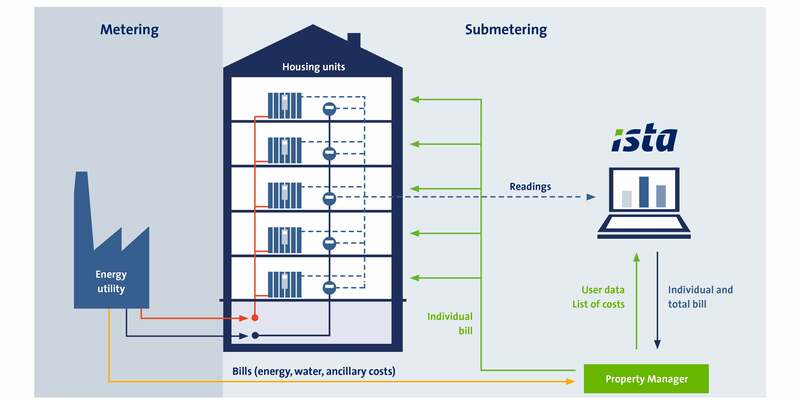 Submetering is a unique tool to save energy and CO2 emissions in buildings. As a low-cost investment, it provides full transparency of individual energy consumption to tenants and apartment owners. This transparency enables to actively steer and reduce their energy consumption – simply by changing their own behaviour and without further technical equipment. The European Commission sees savings potentials of between 15 and 30% of energy, costs and CO2 emissions. This makes submetering the most efficient measure to save energy in buildings. Whereas energy utilities bill the total consumption of the individual buildings as costs, energy service providers like ista record using advanced metering technology how these costs are distributed within the building. Making sure everyone only pays for what they actually consume. Due to the energy saving potential of Submetering the European Energy Efficiency Directive (EED) stipulated that the European member states had to create the appropriate statutory framework by mid-2014. Actual implementation of the measures themselves is then to commence by early 2017 at the latest.